It has become a truism within the DevOps movement that embracing DevOps is much more about making a cultural change than about adopting new processes and technologies. But changing an organization’s existing internal culture can be profoundly difficult. As Peter Drucker famously noted, “Culture eats strategy for breakfast.” All the best-laid DevOps plans in the world might not make a bit of difference if you can’t get your team to shift its mindset. 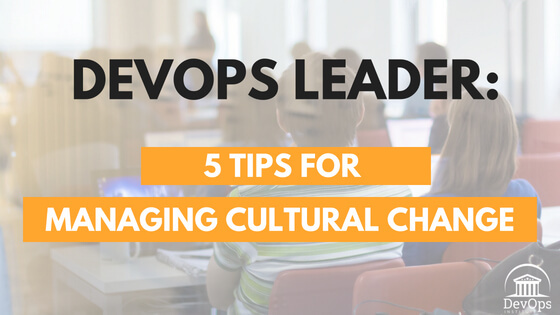 As a DevOps leader, managing this cultural change will likely be one of your most frustrating — but ultimately most rewarding — challenges. 1. Cultivate the 5 leadership traits that lead to high performance. Pick up any self-help book, and you’re sure to read some variation on the mantra that you can’t control whether other people change, you can only control yourself. It might be trite, but it’s true. Fortunately, as a DevOps leader, you can make changes in yourself that tend to lead to better performance for your team. The most recent DORA State of DevOps report revealed, “The characteristics of transformational leadership — vision, inspirational communication, intellectual stimulation, supportive leadership, and personal recognition — are highly correlated with IT performance.” By developing these characteristics within yourself, you can help set your team up for success. 2. Get to know your team. Writing for DevOps.com, Helen Beal examined the importance of understanding other peoples’ motivations. “Conflict often occurs when people don’t understand each other,” she wrote. But rather than embarking on a frivolous team-building exercise, she recommended using a more scientific approach to learning more about your personality and the personalities of the people you work with. That might involve the SCARF self-assessment, the MBTI or another well-researched instrument. 3. Ask people to explain their current processes. 4. Focus on changing behaviors, not beliefs. 5. Measure and reward the right things. You can learn more about managing the cultural change necessary for DevOps through our DevOps Leader (DOL) Certification. Learn how to design a DevOps organization, get ideas for organizing workflows, define meaningful metrics, gain value stream mapping skills, discover the Spotify Squad model, and much more. Get certified today—find an education partner near you!